Health Concerns General Health - Enhance - 420 Tablets. Your immune system has one of the most important jobs in your body: it must protect you from germs&sbquo; viruses&sbquo; toxins&sbquo; and other foreign invaders. Most of the time&sbquo; it does an excellent job. However&sbquo; lowered immunity can open the door to a host of illnesses. The strength of your immune system can be compromised by a poor diet&sbquo; a sedentary lifestyle&sbquo; stress&sbquo; and disease. You can strengthen your immune system by eating a well balanced diet that includes a variety of different colored fruits and vegetables&sbquo; whole grains&sbquo; and lean meats. Getting adequate rest and regular exercise can also boost your immunity. You can also take advantage of traditional Chinese medicine&sbquo; which offers herbal remedies to alleviate some symptoms. For instance&sbquo; if you have problems with decreased or suppressed immunity&sbquo; ancient herbal supplements may help activate your body&rsquo;s natural defenses. A product like Health Concerns&rsquo; Enhance fights inflammation and pain while strengthening the immune system. Enhance Tablets provide a variety of Chinese herbs that may help boost immunity and reduce symptoms associated with inflammatory conditions. Some of these ingredients include: Lingzhi Mushroom&mdash;an ancient mushroom that has been used medicinally for ages; this fungus has been shown to support immunity. Isatis dried leaf and root extract&mdash;traditionally used in Chinese medicine&sbquo; this herb may be used to treat the common cold and sources of inflammation in the body. Spantholobus root&mdash;an herb that may help stimulate bone marrow function and enhance the strength of your body's immune system. Astragalus root&mdash;combats infection. Andrographis herb&mdash;also used to promote overall health. For optimal benefit&sbquo; the recommended dosage of Enhance by Health Concerns is five tablets&sbquo; four times daily. Each bottle provides 420 tablets. Health Concerns is dedicated to providing quality herbal therapies to its customers. The company has taken herbal therapies that have been used for thousands of years in Traditional Chinese Medicine and put in a more convenient tablet form. These statements have not been evaluated by the Food and Drug Administration (FDA). These products are not meant to diagnoseÃ¢ÂÂ treat or cure any disease or medical condition. Please consult your doctor before starting any exercise or Nutritional supplement program or before using these or any product during pregnancy or if you have a serious medical condition. 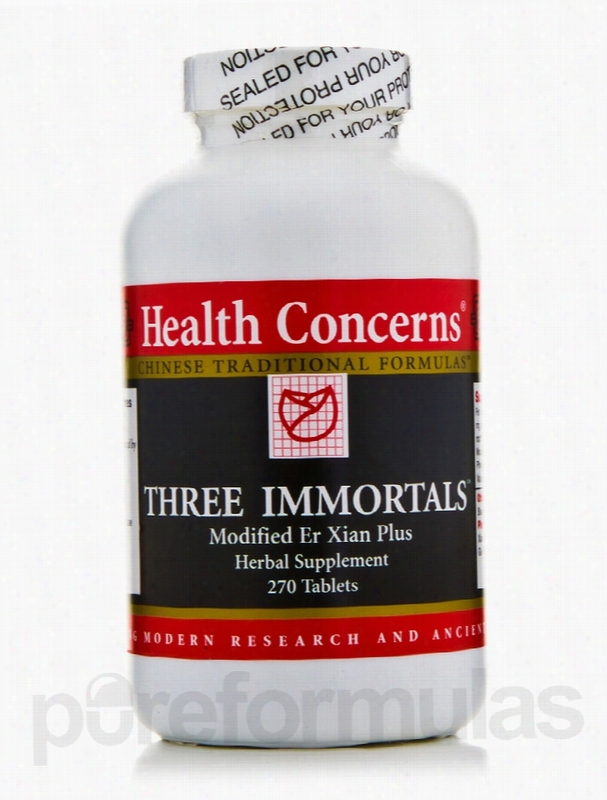 Health Concerns Women's Health - Three Immortals - 270 Tablets. Health Concerns Herbals/Herbal Extracts - NuLignan - 90 Tablets. Menopause is not just a time when women are plagued with bothersome night sweats&sbquo; hot flashes&sbquo; and mood swings. Though these symptoms of menopause can make these changes seem almost unbearable&sbquo; even worse is the fact that this time period also sees increased chances of a woman developing life-threatening health problems. Low estrogen levels may result in substantial weight gain&sbquo; an increased risk of bone loss or breakage&sbquo; and even cardiovascular disease. There's nothing you can do to prevent menopause from happening&sbquo; but there are ways you can control and even eliminate some of the troublesome symptoms that come with age. Health Concerns&rsquo; NuLignan is a supplement that contains 7-hydroxymatairesinol HMRLignan&sbquo; a natural compound extracted from spruce trees. This lignan formulation&sbquo; made from plant-derived compounds&sbquo; has proven to be effective at reducing night sweats and hot flashes. When taken regularly&sbquo; it also promotes good overall health while strengthening your cardiovascular system. A few of the other possible benefits you can get from taking NuLignan include: Increased energy Balanced hormones Protection from disease-causing free radicals Stronger bones Improved memory and the ability to think more clearly Mood enhancement Studies have shown that lignans can greatly improve the mental and physical health of women who are suffering from menopause. Many studies have shown not only significantly fewer occurrences of hot flashes in menopausal women at the end of eight weeks of use&sbquo; but also improvement in the cognitive function of postmenopausal women. Men may also benefit. Lignans also have some anti-inflammatory properties. This means that taking NuLignan may also help reduce joint pain and stiffness. 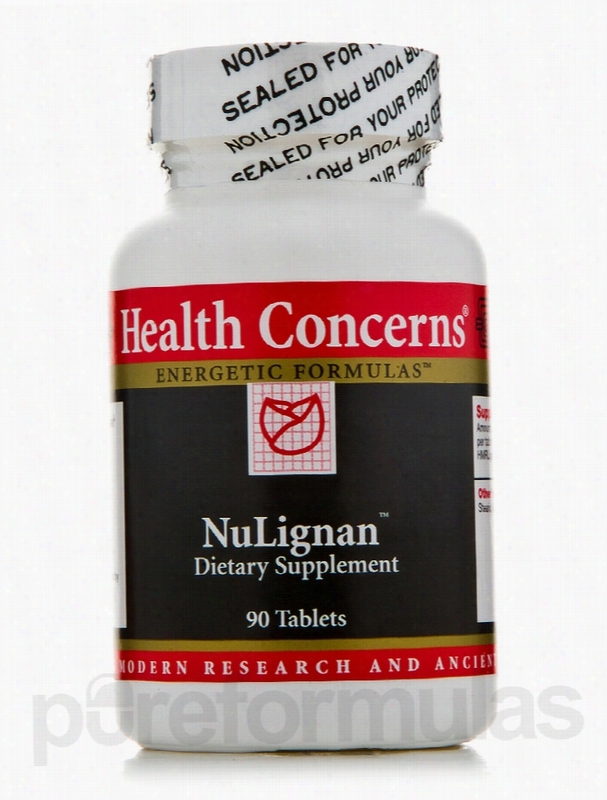 One 90-tablet bottle of NuLignan by Health Concerns will last one to two months&sbquo; depending on your dosage. 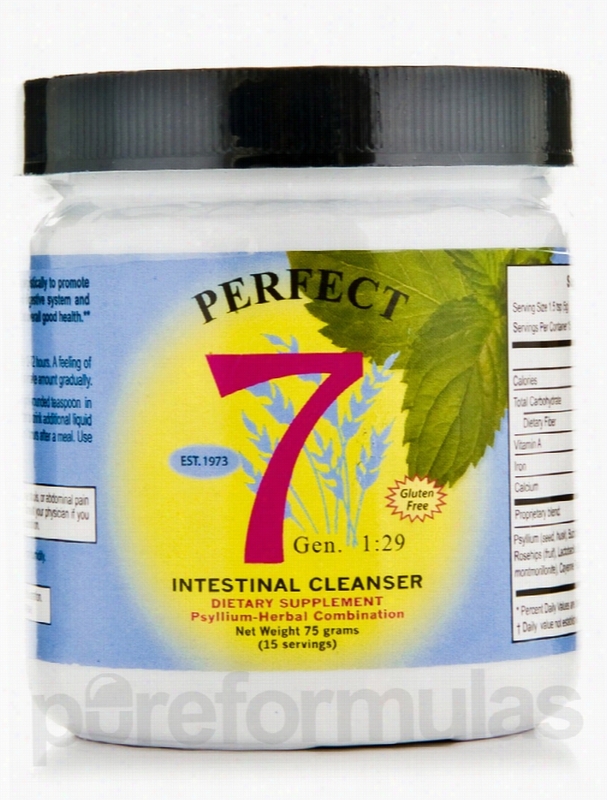 Health Concerns is dedicated to providing quality Herbal therapies to its customers. The company has taken herbal therapies that have been used for thousands of years in Traditional Chinese Medicine and put in a more convenient tablet form. These statements have not been evaluated by the Food and Drug Administration (FDA). These products are not meant to diagnoseÃ¢ÂÂ treat or cure any disease or medical condition. Please consult your doctor before starting any exercise or nutritional supplement program or before using these or any product during pregnancy or if you have a serious medical condition. Health Concerns General Health - SAMe - 60 Tablets. 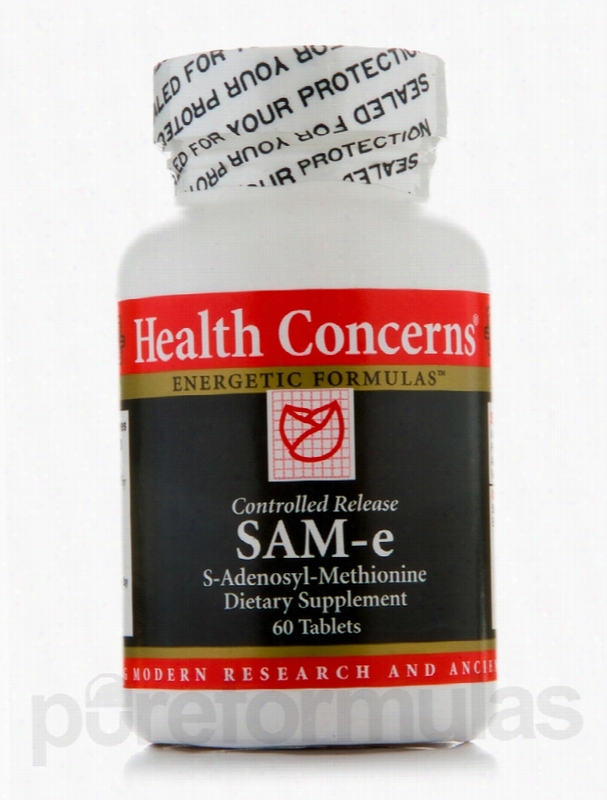 Health Concerns&rsquo; SAM-e Tablets are a good source of synthetic SAMe (S-Adenosyl-Methionine)&sbquo; which is a compound that could potentially act to maintain overall well-being in several ways. For instance&sbquo; SAMe&mdash;which your body creates by combining adenosine triphosphate (ATP) and the amino acid methionine&mdash;might have a gentle anti-inflammatory effect. Therefore&sbquo; SAM-e Tablets may help address certain symptoms associated with minor pain and stiffness in the muscles or joints. In addition&sbquo; S-Adenosyl-Methionine may be involved in boosting serotonin and dopamine levels in your brain. Since these neurotransmitters play key roles in regulating your mood&sbquo; SAM-e Tablets could potentially work to alleviate some signs of mild sadness. Finally&sbquo; this controlled-release SAMe supplement might act to support liver health. Specifically&sbquo; it may work to maintain already healthy levels of liver enzymes&sbquo; stimulate bile flow&sbquo; and protect the liver from certain toxins. The recommended serving size is two tablets one to four times daily. Each 60-count bottle of SAM-e Tablets by Health Concerns should last for up to one month. These statements have not been evaluated by the Food and Drug Administration (FDA). These products are not meant to diagnoseÃ¢ÂÂ treat or cure any disease or medical condition. Please consult your doctor before starting any exercise or Nutritional supplement program or before using these or any product during pregnancy or if you have a serious medical condition. Health Concerns General Health - Cordyceps PS - 50 Tablets. When you seek medical treatment for an illness or disorder&sbquo; your doctor will probably just treat the organ with which you&rsquo;re having trouble. This is how Western medicine handles illness; it typically treats the affected area. Eastern medicine&sbquo; however&sbquo; is handled very differently. The ancient Chinese treated illness as a &ldquo;whole body&rdquo; condition&sbquo; in which every organ is connected to another and considered when developing treatment. Qi&sbquo; or life energy&sbquo; is believed to flow through and connect every body part. If the flow of qi is blocked&sbquo; illness or disease may be the result. To diagnose an illness&sbquo; traditional Chinese health practitioners often use a concept of yin/yang (shadow and light&sbquo; symbolizing how polar opposites are connected) and five elements&mdash;fire&sbquo; earth&sbquo; metal&sbquo; water&sbquo; wood&mdash;all of which explain the origin of the illness. To treat illness&sbquo; Chinese medicine uses herbs that are believed to have an effect on these elements of the body. If you have lung problems such as coughing&sbquo; wheezing&sbquo; or trouble breathing&sbquo; a Chinese health practicioner will likely prescribe herbs that have relatively few major side effects. Health Concerns&rsquo; Cordyceps PS is an all-natural herbal supplement that works to improve lung function&sbquo; and may also be effective in treating chronic fatigue syndrome and liver issues. The only active ingredient of these Tablets is cordyceps from Dong Chong Xia Cao extract. Through the toning properties of Kidney yang and the nourishing Lung yin&sbquo; it may help strengthen the immune system&sbquo; making you feel better. This supplement may also promote improved athletic performance. Take two tablets&sbquo; two to three times daily. 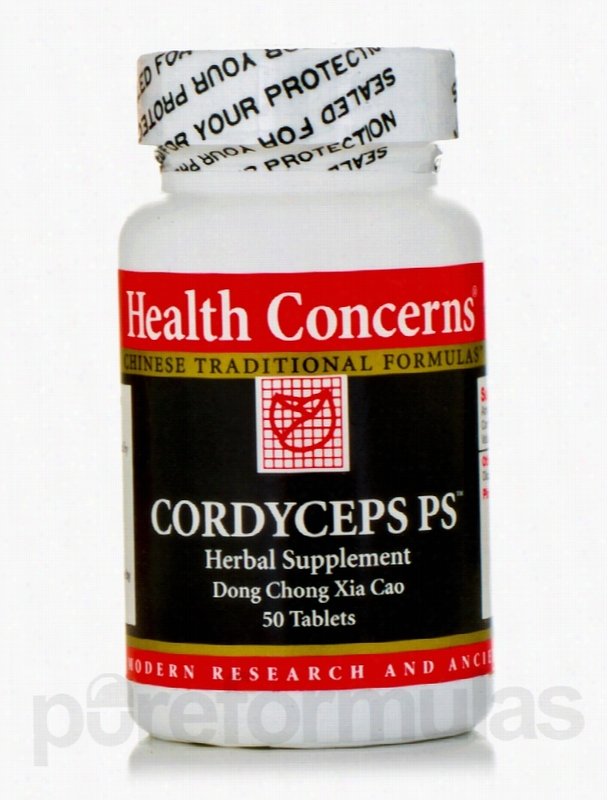 One bottle of Cordyceps PS contains 50 tablets. Health Concerns is dedicated to providing quality herbal therapies to its customers. The company has taken herbal therapies that have been used for thousands of years in Traditional Chinese Medicine and put in a more convenient tablet form. These statements have not been evaluated by the Food and Drug Administration (FDA). These products are not meant to diagnoseÃ¢ÂÂ treat or cure any disease or medical condition. Please consult your doctor before starting any exercise or nutritional supplement program or before using these or any product during pregnancy or if you have a serious medical condition. Health Concerns General Health - Virility Tabs - 90 Tablets. 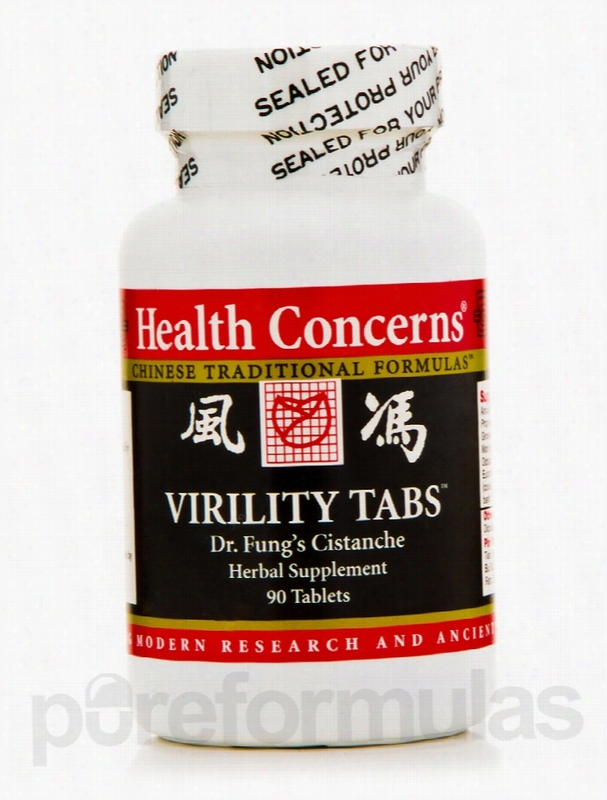 Health Concerns&rsquo; Virility Tabs contain a blend of Chinese herbs that could potentially work to support healthy reproductive function in men. For example&sbquo; cistanche (rou cong rong) may play a role in maintaining optimal sperm activity as well as a healthy libido. Moreover&sbquo; Virility Tabs also provide morinda (ba ji tian) and cynamorium (suo yang)&sbquo; which are two herbs that might be involved in regulating potency due to their potential to tonify the kidneys. According to proponents of traditional Chinese medicine&sbquo; many of the herbs in this supplement may also work to alleviate certain symptoms associated with kidney yang deficiency&sbquo; such as mild lower back pain&sbquo; cold limbs&sbquo; or frequent urination. Finally&sbquo; the rehmannia (shu di huang) in Virility Tabs might act to support an overall sense of well-being and vitality&sbquo; especially as you get older. Take two Tablets two to three times daily. At the recommended serving size&sbquo; each 90-tablet bottle of Virility Tabs by Health Concerns should last for roughly two to three weeks. These statements have not been evaluated by the Food and Drug Administration (FDA). These products are not meant to diagnoseÃ¢ÂÂ treat or cure any disease or medical condition. Please consult your doctor before starting any exercise or nutritional supplement program or before using these or any product during pregnancy or if you have a serious medical condition. 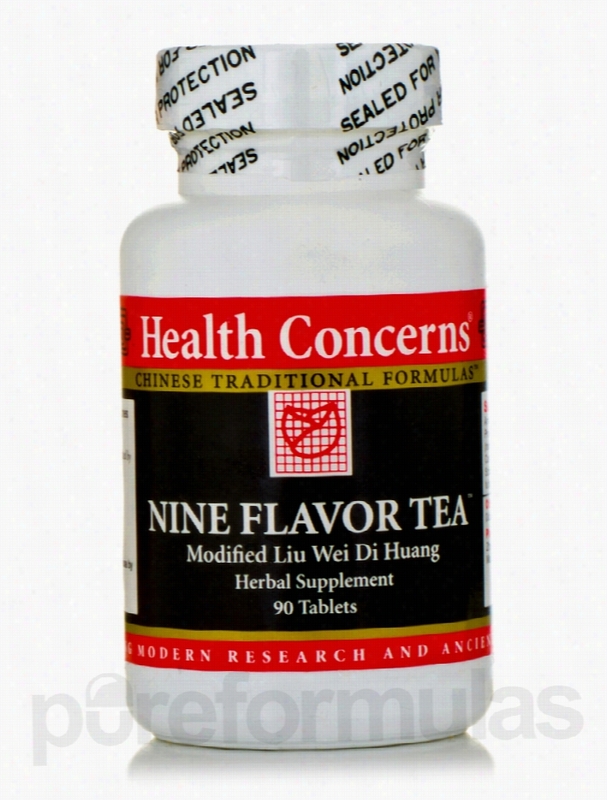 Health Concerns General Health - Nine Flavor Tea - 90 Tablets. Nine Flavor Tea Tablets by Health Concerns might work to maintain general health by providing a wide array of Chinese herbs. In fact&sbquo; Nine Flavor Tea Tablets contain a modified liu wei di huang formula. One of the main ingredients in this formula is rehmannia (sheng di huang)&sbquo; which may help address certain symptoms associated with a sore throat. In addition&sbquo; the cornus fruit (shan zhu yu) in this formula might play a role in relieving excessive sweating due to its potential to stabilize the kidneys. According to proponents of traditional Chinese medicine&sbquo; many of the herbs in Nine Flavor Tea Tablets could potentially work to tonify kidney and spleen qi. As a result&sbquo; this supplement might play a role in alleviating mild tinnitus (ringing in the ears) and dizziness as well as other symptoms associated with deficiencies in spleen or kidney qi. At the recommended serving size of three tablets three times daily&sbquo; each 90-count bottle of Health Concerns&rsquo; Nine Flavor Tea Tablets should last for 10 days. These statements have not been evaluated by the Food and Drug Administration (FDA). These products are not meant to diagnoseÃ¢ÂÂ treat or cure any disease or medical condition. Please consult your doctor before starting any exercise or nutritional supplement program or before using these or any product during pregnancy or if you have a serious medical condition. 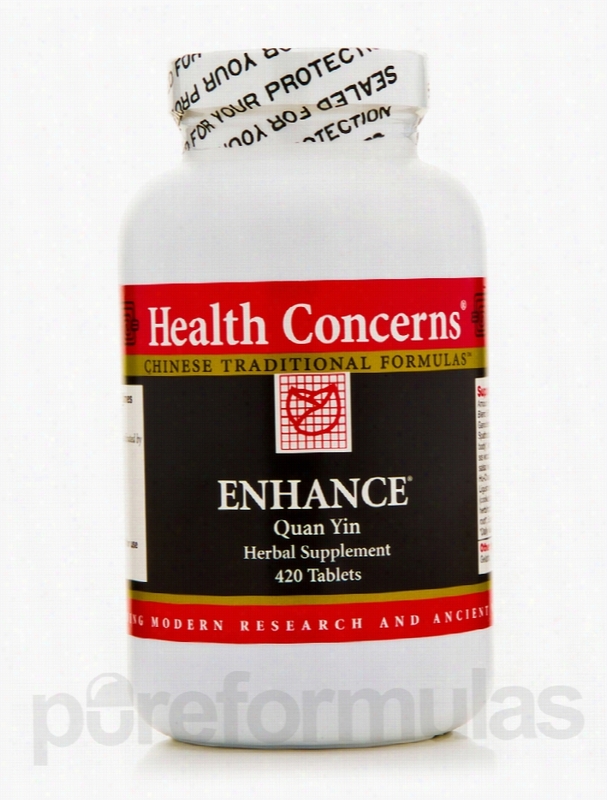 health Concerns General Health - Great Yin - 90 Tablets. Health Concerns&rsquo; Great Yin may work to promote overall well-being by providing a Chinese herbal formula known as da bu yin. Specifically&sbquo; Great Yin contains herbs such as rehmannia (shu di huang)&sbquo; tortoise shell (gui ban)&sbquo; and phellodendron (huang bai). Rehmannia root might work to nourish the blood&sbquo; which means that it could play a role in alleviating symptoms like mild dizziness or trouble sleeping. On the other hand&sbquo; phellodendron may act to relieve minor redness&sbquo; swelling&sbquo; or pain in your legs by working to drain damp-heat from the lower jiao. According to proponents of traditional Chinese medicine&sbquo; da bu yin may also help address some signs of yin deficiency. As a result&sbquo; a supplement like Great Yin could potentially work to alleviate discomfort associated with mild night sweats and hot flashes. Take three tablets three times daily. 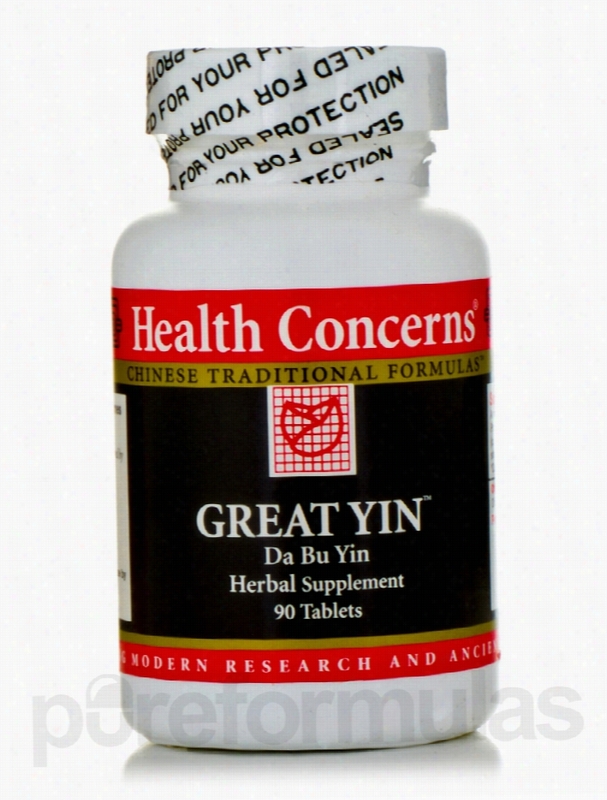 Each 90-tablet bottle of Great Yin by Health Concerns should last for 10 days at the recommended serving size. These statements have not been evaluated by the Food and Drug Administration (FDA). These products are not meant to diagnoseÃ¢ÂÂ treat or cure any disease or medical condition. Please consult your doctor before starting any exercise or Nutritional supplement program or before using these or any product during pregnancy or if you have a serious medical condition. 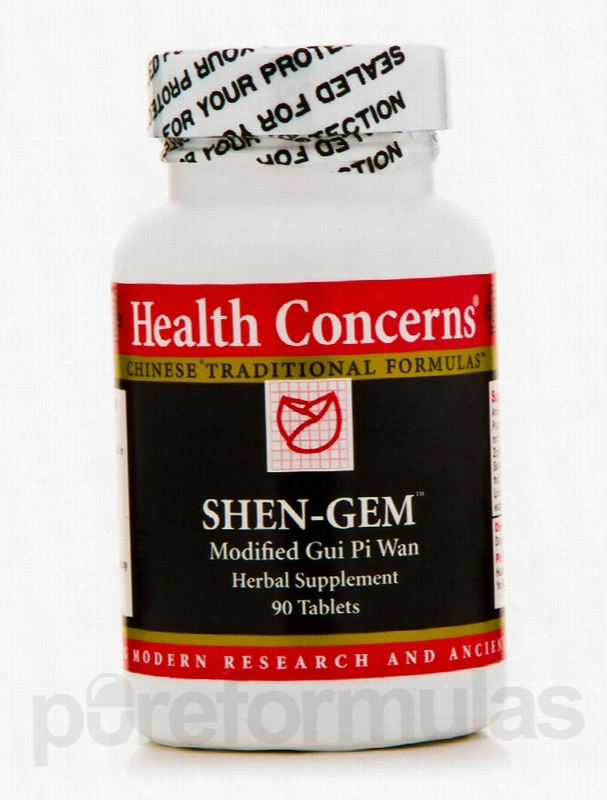 Health Concerns General Health - Shen-Gem (Ginseng & Longan) - 90. Shen-Gem (Ginseng &amp; Longan) by Health Concerns provides a wide array of Chinese herbs that could potentially work to maintain overall well-being. Two of the main ingredients in this modified qui pi wan blend are Asian ginseng (ren shen) and longan (long yan rou). As a result&sbquo; Shen-Gem (Ginseng &amp; Longan) may help address certain symptoms associated with Stress&sbquo; like mild heart palpitations&sbquo; anxiety&sbquo; or trouble sleeping. In addition&sbquo; this supplement might work to support memory and cognitive function. According to proponents of traditional Chinese medicine&sbquo; other herbs in Shen-Gem (Ginseng &amp; Longan)&mdash;such as white atractylodes (bai zhu)&sbquo; zizyphus (suan zao ren)&sbquo; and amber (hu po)&mdash;may have a gentle calming effect on the shen (spirit); these herbs may also work to tonify spleen and heart qi. Take three tablets two to three times daily between meals. Each bottle of Health Concerns&rsquo; Shen-Gem (Ginseng &amp; Longan) contains 90 tablets&sbquo; which should last for 10 to 15 days at the recommended serving size. These statements have not been evaluated by the Food and Drug Administration (FDA). These products are not meant to diagnoseÃ¢ÂÂ treat or cure any disease or medical condition. Please consult your doctor before starting any exercise or nutritional supplement program or before using these or any product during pregnancy or if you have a serious medical condition.